Miles Teller Talks Dating, ‘Divergent,’ & ‘That Awkward Moment’ (JJJ Interview!) | Exclusive, Miles Teller, That Awkward Moment | Just Jared Jr. Miles Teller opens up about his upcoming film That Awkward Moment in this brand new JJJ interview! The 26-year-old actor stars alongside Zac Efron and Michael B. Jordan in the film, which is about three best friends who vow to maintain their single status for as long as possible when one of them is devastated by a recent breakup. We caught up with Miles about the film, his tips for dating, and his role in Divergent. That Awkward Moment hits theaters on January 31, 2014! JustJaredJr: So let’s talk about your character. Are you guys a lot alike? Miles Teller: I think my character rallies people together to go out and drink. And for a long time, that was me, but I think I lost a step and I’m just getting older or something. I would say that…I care a lot about my friends, so I want everybody to have the best time. JJJ: How did you prepare for the role? JJJ: What’s the meanest thing a guy could do on a date? MT: F-cking text during a date. I think that’s pretty douchey. Or tweet or something. Just turn your phone off. JJJ: What’s something a girl could do that would win you over immediately? MT: Just be herself. I like girls who are cute and naturally funny. As long as they are not too high-maintenance, then we’re good. JJJ: What are some flirting tips you’ve picked up on? MT: Listen. It’s the same thing with improv. If you’re too busy thinking about your line and your own stuff, you’re not really taking in what this person is saying. And I think girls are surprised when you actually really listen and then you call it back at the end of the night. Plus, it gives you more to work on, talk about the things she’s interested in. Listening just opens up a lot of possibilities. JJJ: Obviously, you also have Divergent coming up next year too. What was your audition process like for that? MT: I didn’t have to audition. The director saw Shailene [Woodley] and I in Spectacular Now, and said, “Hey, would you be interested in this?” I originally auditioned for Four and that didn’t work out. And they’re like, “We think you would make a good villain. Would you want to play the role of Peter?” And I said “Yeah, sure.” I didn’t know much about him. I read the script, obviously. Once I was cast and people were talking about it online, I read the book after. I didn’t know that Peter was so hated. MT: He saves her life. I think in the third book, I think he’s going to come around even more. JJJ: Agreed! This is not the first film adaptation you’ve done. How do you go about it? Do you read the book or focus just on the script? MT: You read the book I think because it gives you more information about someone, which I want. But at the same time…obviously, I read about two-thirds of Spectacular Now and then I think I just stopped because the more they were talking about this kid, that’s not how I was playing him. I didn’t want to get too invested in…the character in the book is a little more of a caricature. 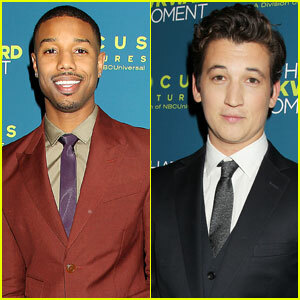 Zac Efron & Michael B. Jordan: People's Choice Awards 2014 with Miles Teller!